Mr. Dell’Olio has 25 years experience in the investigative industry, which includes working as a Senior Investigator for Beau Dietl & Associates for 13 years and as a New York State Investigator for nearly two years. In addition, Mr. Dell’Olio has been a licensed private investigator and has been running his own investigative firm for the last 9 years. As a Senior Investigator for Beau Dietl & Associates, he has led corporate fraud investigations, conducted numerous criminal, civil, and insurance investigations, and performed countless surveillance. As well, he has supervised numerous security assignments, including a four month, twenty four hour, 175 armed personnel strike detail. 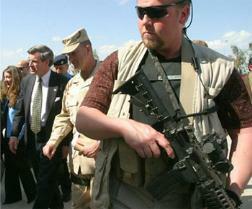 Private Security Firm in Iraq protecting Paul Bremer.